'Amazing Scene' As Riot Shuts Foxconn Plant In China : The Two-Way Authorities say 2,000 workers went on a rampage over a "personal dispute." Some workers, though, are saying the dispute relates to on-going tensions at the factory where products are made for Apple and other high-tech giants. At one point overnight as many as 2,000 workers at a Foxconn plant in Taiyuan, China, were involved in a riot that drew 5,000 police officers to the site and has closed the facility that makes parts for Apple's iPhones and hardware for other companies including Microsoft and Hewlett-Packard. Just what set off the riot is the key question. Frank says that officially, authorities are saying it was a "personal dispute" between workers from different parts of China. But some of those employees are saying on social media sites that the unrest is connected to ongoing tensions at the plant over such procedures as the daily security checks that workers must go through to prove they aren't trying to sneak products out of the plant. There's "anger brewing," Frank reports, over allegations that security guards constantly push around the workers and in some cases have even beaten them. Foxconn has, you likely will recall, been the subject of numerous reports and complaints in recent years about working conditions at its factories. 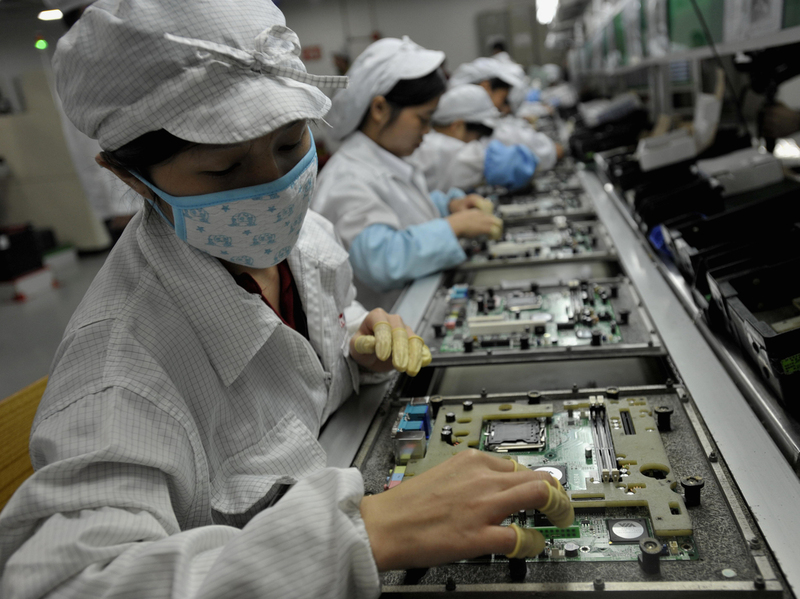 In August, NPR's Steve Henn talked with Morning Edition about a report from the Fair Labor Association that found, he said, "improvements in conditions at three huge factories that make products, like the iPhone and iPad." But, Steve added, "one of the biggest challenges facing Foxconn and Apple is figuring out how to eliminate illegal overtime in all of their plants. This is a chronic problem in China." "It was not immediately clear how long the shutdown would last at the plant, which employs about 79,000 people in the Shanxi provincial capital, while police and company officials investigate the cause of the disturbance.
" 'The plant is closed today for investigation,' Foxconn spokesman Louis Woo told Reuters, but a company employee contacted by phone said the closure could last two or three days." Among the products the plant makes parts for is the new iPhone5, ComputerWorld says. Huge demand for the latest version of the phone, which was released just last week, already has it in short supply. For more about Foxconn, see this report from the BBC about the "hidden dragon."